An official with Health and Human Services says the more than 2,300 children separated from their parents at the border as a result of a zero-tolerance policy on illegal crossings won't be immediately reunited with their families. Kenneth Wolfe, a spokesman for the department's Administration for Children and Families, says their cases will proceed through the system. HHS Secretary Alex Azar said his department will start reuniting detained immigrant children with their parents, but he made no specific commitment on how quickly that can be accomplished. And officials said the cases of the children already separated and turned over to their custody would proceed as usual. The children who are separated from their families are turned over to HHS within 72 hours and are then categorized as unaccompanied minors who are eventually placed with sponsors. Officials have said they were working to reunite families as soon as possible but provided no clear answers on how that was going to happen. 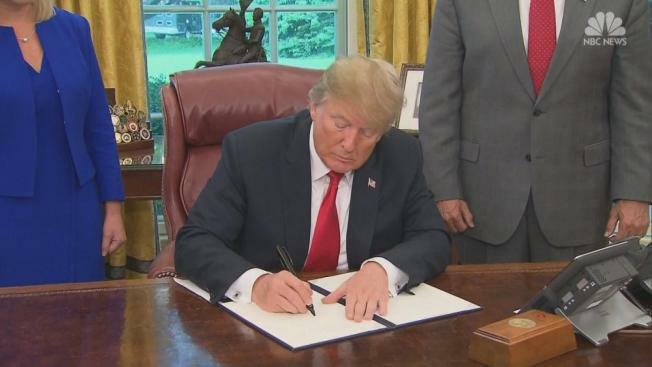 President Donald Trump on Wednesday signed an executive order that stopped the separations.